To begin with you should know I am not a big fan of reality TV. OK, I should amend that statement by saying, I don't watch non-food reality TV. I watch shows such as Top Chef and Hell's Kitchen. As a rule though, I don't care to watch people screw each other over and act behind people's back. If that's your reality, your not living a good life. 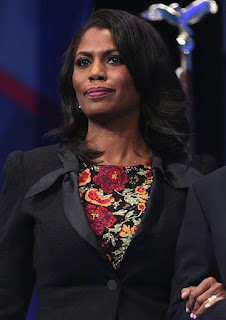 Subject: Omarosa | Date: 02/24/2017 | Photographer: Gage Skidmore |This file is licensed under the Creative Commons Attribution-Share Alike 3.0 Unported license. That being the case, even though I never watched The Apprentice, I knew who Omarosa was. Thanks to commercials and general pop culture buzz, it was obvious she was the loudmouth villain of the show. However, she was also a favorite with fans, so NBC kept looking for reasons to put her back on the show. Her popularity made her inclusion in Donald Trump's presidential campaign a no brainer. She gave Trump's entourage a badly needed splash of color. After the campaign she was given a loosely defined White House job for the same reason. Nobody knew exactly what she was supposed to do, but she helped make the White House look at little less white. Perhaps because of her background in reality TV, she knew enough to watch her back. To that end, she covertly recorded many of her conversations on the job. Last week she published a tell all book about her days in the White House. To promote her book she has been releasing recordings to the news one by one. Perhaps the most damaging of these recordings so far, chronicles Trump's daughter-in-law offering her a 15K per month "no show" job in exchange for her silence upon leaving the White House. The conversation sounded like it had been lifted from an episode of the Sopranos. We don't know what other gems Omarosa plans to release, or when. One can only speculate whether she has anything that Mueller can use in his investigation. However, even though she's doing what she is doing to promote herself, she may prove to be the hero who finally nalis Donald Trump. Only time will tell. Labels: Pop Culture, Washington D.C.